Introducing Robonaut R2: The robot that uses Twitter. In outer space. | UNBELIEVABLE! Introducing Robonaut R2: The robot that uses Twitter. In outer space. R2 is a robot with a difference. 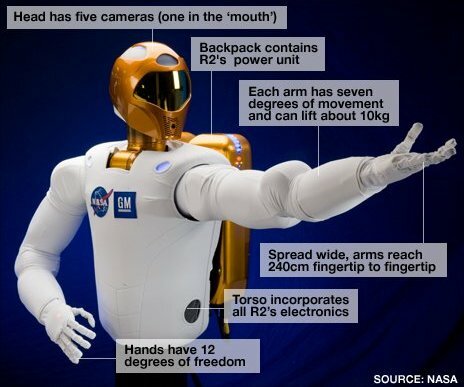 Not only is it the first ever human-like astronuat robot, but it uses social networking website Twitter to write status updates from The International Space Station. The popular robonaut has already acquired over 40,000 followers on the site. R2 has been designed to assist astronauts in The ISS, both inside and outside the station. (It describes itself on its Twitter profile as “A humanoid robot designed to work side by side with humans, or go where the risks are too great for people”). The robot currently sits in a fixed base, but eventually NASA plans to attach legs so that R2 can crawl through the Station corridors. Further forward in time, it may even be mounted to a 4-wheel rover and sent to explore the surfaces of Mars and the Moon. Posted on August 25, 2011, in Physics, Technology and tagged Astronauts, International Space Station, R2, Robonaut, Robot, Space, Twitter. Bookmark the permalink. Leave a comment.